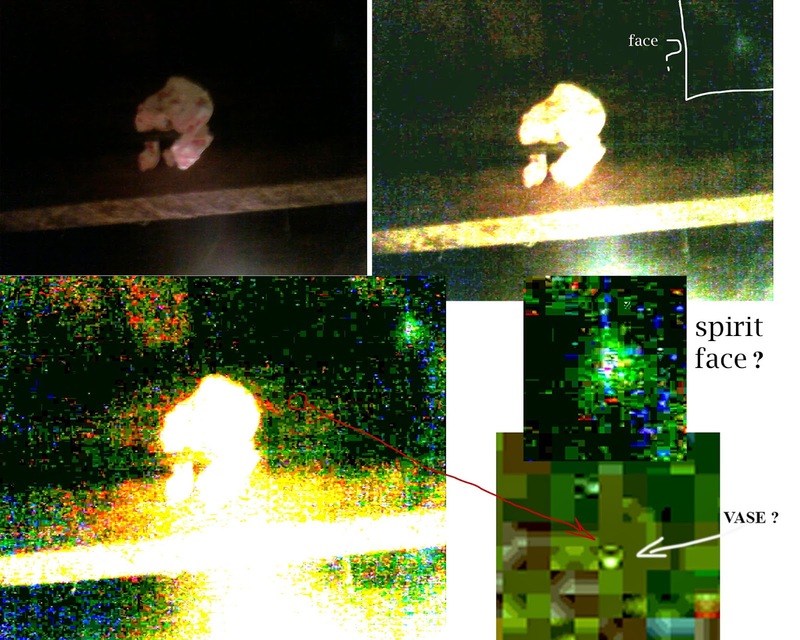 Here is an excerpt from my book, Estate of Horror and what lead up to us capturing this incredible and un-explainable photo taken during a heightened state of paranormal activity in Paul's Basement- June 10th 2009. 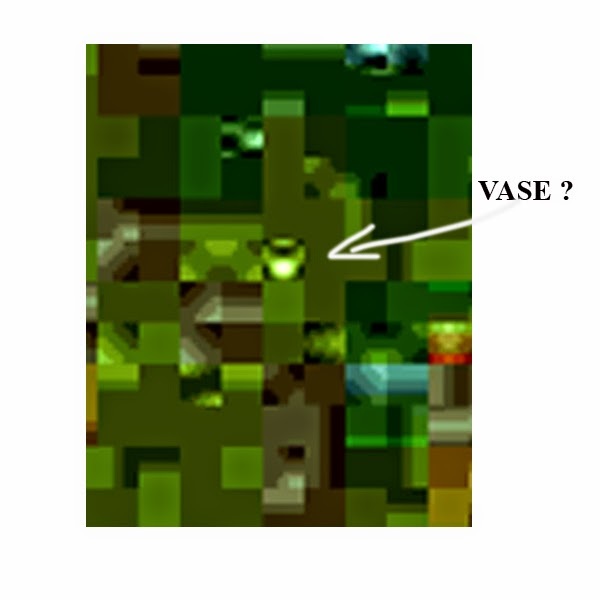 I make no claims to know what this photo is-just our theories and observations. I have never seen any photo like this in all the vast supernatural related photos I've seen in the paranormal communities online or anywhere. You can look at this photo for hours and see so much in it. Perhaps someone out there has an answer? Chris motioned to the plastic wardrobes that were in his way. “Just hold these back,” he said. He moved forward and in the light we could tell that the projector was rusty and in bad shape. I bent down to look at it. As I stood up and a blue cotton hankie fell to the floor. I looked around. Chris turned around and a second later – swoosh – the blue hankie flew on top of the wardrobe and he began to laugh. “Look, Mom,” he said and pointed it out to me. “Get some pictures of that!” I said. “Other people may not believe us, but I know what I just saw,” I said. 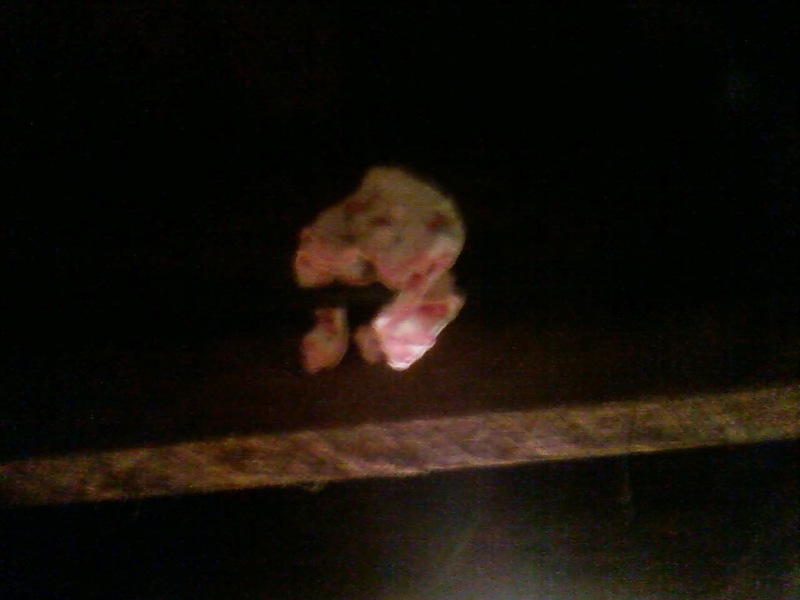 Original cell phone photo taken by Chris of the pink handkerchief hanging in the ceiling rafters. I had had a meltdown and was in bed with a fever, coughing and downing Robitussin. However, taking some time off to recuperate gave me a chance to review the one good photo Chris took of the hankie that flew up the basement rafters. It was only a cell phone photo, and it was dark, but the resolution wasn’t bad. The picture showed the hankie wrapped around a thick electric cable in the ceiling. I loaded the photo from Chris’ cell phone into my computer software program, Photoshop. I took one copy of the original photo and hit a level tool in the software program to see if it would lighten the picture, but it didn’t make it any better. 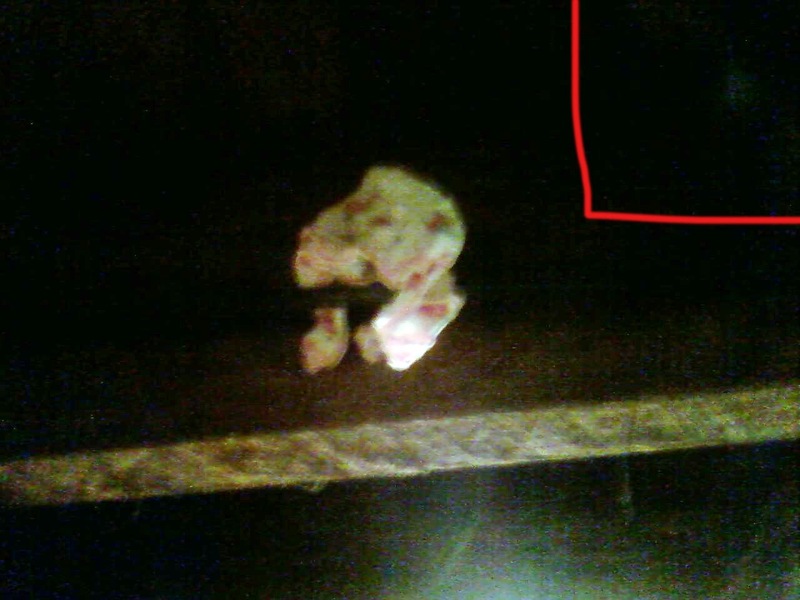 It showed a slightly pink fuzzy cloth hankie in half shadow against a black background of the wooden ceiling rafters. I looked at the digital photo closely with my trained eyes and thought I saw a slight whitish smudge in the blackness on the upper right corner of the picture. What is that? I thought to myself. I decided to crop the picture around the whitish area, which would make the area larger so I could see if there were any details. As I zoomed in close, it looked vaguely like a face. I had almost missed it. I was puzzled. What would have caused this white smudgy face when the whole area around the hankie was dead black? Was it a reflection of Chris’ cell phone flash? No. The wood beams were so old and dirty and they weren’t refinished with any varnish, so there hadn’t been a reflection. I was frustrated because it was difficult to see any more details. Then, I had a hunch. I used the level tools in Photoshop again on the cropped picture even though I thought it would be a waste of time. I say this only because once you use levels on a photo as I already had on this photo, it will not change anything further. However, I was in for a shock. I hit the level tool and what happened next is something I’ve never seen before in thirty-four years of working with photos. The photo completely changed into a riot of bright colors of pixel mosaics and images. The main color was a solid deep yellow green with overlapping repeating blocks of colors: deep blues, turquoise, reds, oranges, purples, pinks, browns and grays scattered in no order. The faint whitish smudge at the center of it all was now an illuminated face with its own light source. Light wasn’t reflecting on it to form an image, it was the light! It was also partially absent of pixels. How could that be? What in the world was I seeing? I didn’t recognize the face, but I could definitely make out eyes, nose, a chin and the top outline of a head in bluish white tones. Unlike a standard 35mm camera that records an image on light sensitive film; digital photography uses light sensitive sensors to capture the image focused by the lens and stores it in a digital file ready for processing. You set your digital camera to dpi, which are digital pixels per square inch. FYI-The pattern of pixels evenly spaced throughout makes up a digital picture surface-like your TV screen. 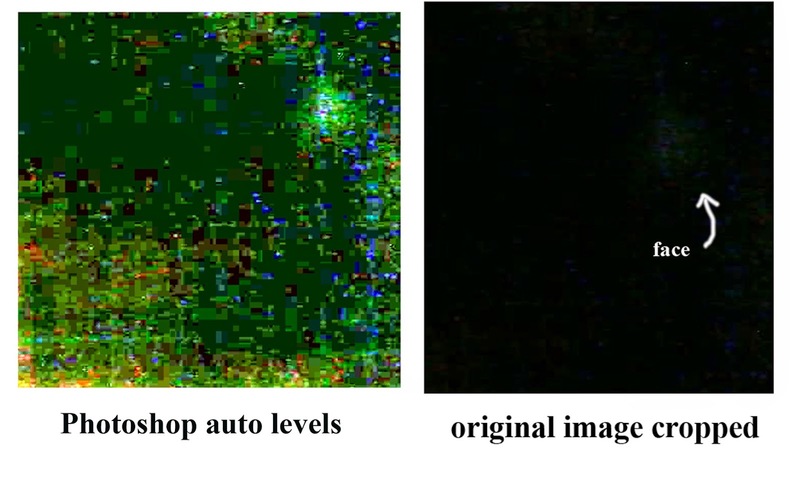 The higher the resolution (like 350 dpi), by using a good digital camera, the better it produces a sharper photo and the less pixilated (or fragmented) the images appear when blown up. The lower digital resolutions (72 dpi) can make an image fuzzy and distorted when enlarged. 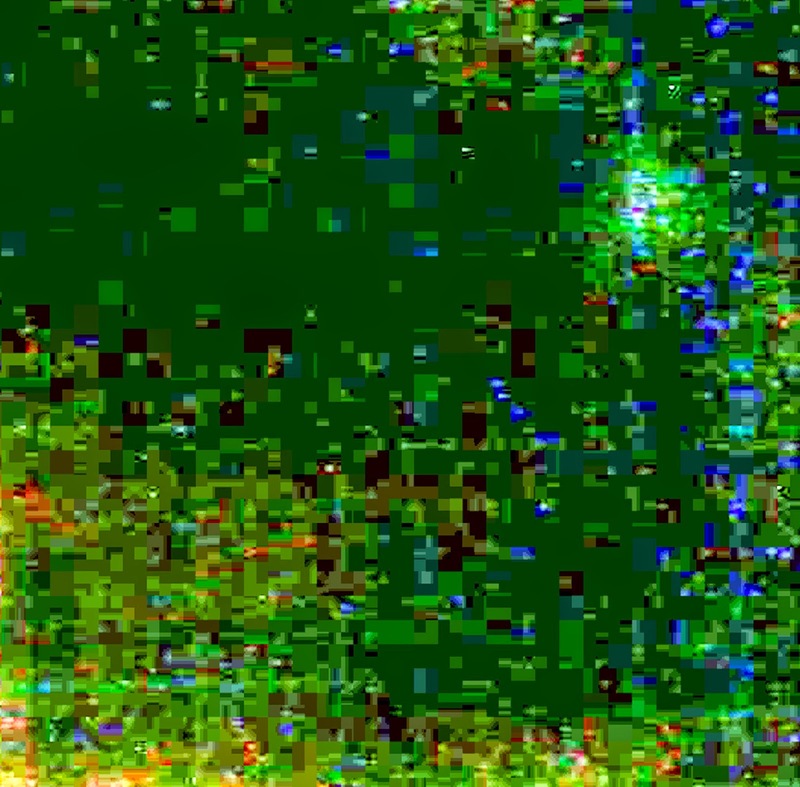 As I blew up the photo further, I could see hundreds more tiny colored square pixels that overlapped in multi-layers to create dimension. This was the dark photo of only a moment ago. I could still see the cotton hankie, but the darkness around the hankie had changed into a crazy quilt of color. These weren’t dust spots either, as you could make out designs and patterns. I had no idea where the color was coming from. Then, it became incredible. Some of the pixels were blocks of variations of a solid color while others in their squares had what looked like objects in them! 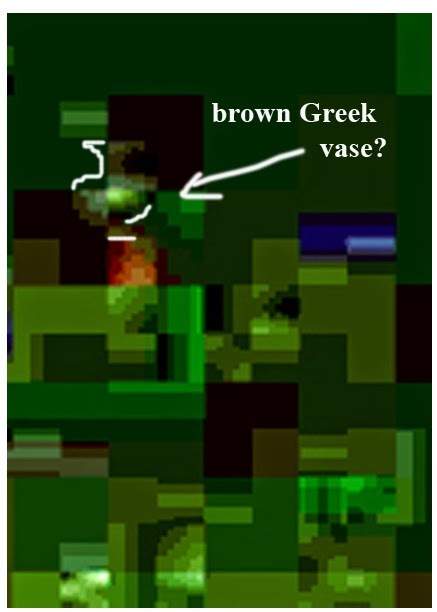 The more I looked at the tiny pixel squares, the more I started making out what looked like an ancient Greek shaped vase, some architectural features like doorways and arches, vertical and horizontal crosses, all different colors and sizes. Some of the squares were very bright white and others had shadows in them. When I showed the photo to my friend Rose, who is an award-winning photographer, she was as baffled as I was. She could also make out designs and see objects as we navigated around the image. “Doesn’t that look like part of a vase and that one remind you of some Aztec or Mayan temple below it?” she asked looking at one particularly interesting pattern. She had a theory. She pointed out that white light breaks up into a spectrum of color when passing through a prism, and wondered if somehow we digitally shot through some type of spectral prism in the blackness that produced the colorful effect. It was an interesting concept but it didn’t explain the artifacts. Collage of images-all original photo files are intact -I have copies here for blog. This is the same image throughout and only manipulated by hitting Level's Tool in Photoshop which I never dreamed would change the photo. Nothing has been included or added to the photo. Could it be possible that the image we digitally captured was holding fragmented memories of tangible thoughts? Did we accidentally photograph the essence of a spirited intelligence? Or were we looking at another dimension?